With the rise in popularity of home-sharing platforms like Airbnb and HomeAway, how are larger, global players in the hospitality industry keeping their business models fresh? In this episode of Mastering Innovation on Sirius XM Channel 132, Business Radio Powered by The Wharton School, Stephanie Linnartz, Global Chief Commercial Officer at Marriott, discusses the varieties of ways that her company is innovating, such as making its own forays into the sharing economy. As a more than 90-year-old organization, Marriott International has a long history of adapting to consumer and market changes. In her time with the company, Linnartz has led experimental projects like connected, Alexa-enabled guest rooms and implementing data analytics to increase consumer personalization, a growing trend across industries. Although such innovations require a technological focus, Linnartz emphasizes human interaction and connection as the keys to providing the best guest experience possible. Siggelkow: One amazing fact of Marriott, and you just alluded it to it in passing, is the sheer size of its operation: a portfolio of more than a million rooms, 6,700 properties, 30 brands, 129 countries, and 750,000 managed or franchised associates. That’s a lot of moving parts. How do you prioritize among 129 countries and technology development? Linnartz: We got to that size and scale with the acquisition of Starwood Hotels and Resorts in late 2016. We were already quite a large global player, but we added more brands and more hotels with that acquisition. In terms of prioritization, we really tried to put the customer at the center of our prioritization efforts and think about what would move the needle with our customers. That can differ in various parts of the world, so we put that lens on it. We do a lot of experimentation and testing of the new products and services in our hotels and the ways we’ll engage with our customers on our website or through our app. We believe very much in the idea of testing, experimenting, seeing what sticks with customers and what they love, then building out from there. Sometimes we have an idea that we think is going to be absolutely fabulous, we test it in a hotel or on our website, and it turns out we were wrong. Not being afraid to test and try and learn and fail and do it all over again is the way we think about things here. Siggelkow: Let’s stick with that theme for a little bit, because lots of firms are trying to do that. What I’ve seen is that experimentation is good, but we never want to fail, right? The question is who has the guts to pull the plug and say, “Oh, actually that didn’t work,” rather than, “Well, let’s try it again. Maybe it would work a second time. Or if that doesn’t work, let’s try it a third time until it works.” How do you balance and structure that? Because when people are getting engaged with, “This was my idea; it was my baby,” it’s very hard to pull the plug sometimes. Linnartz: You’re absolutely right. All companies have to struggle with this idea. We get very wedded to our ideas and we don’t want to let them go. It’s helpful when you’re able to test and try something on a relatively small scale. It is easier for human beings to let that idea go if it doesn’t work, instead of investing so much time, money, and effort and the idea not working. It’s human nature that it’s harder to pull back from that. Another thing that we do here at Marriott International is quite a bit of work with our partners. We try to learn from them and test with them. As an example, in the case of Asia Pacific in China, we have a joint venture with Alibaba. We are testing a travel platform for outbound Chinese travelers. Through that joint venture, we’re testing and trying a lot of different things to see what will stick with the Chinese consumer in terms of really getting them to travel to our hotels outbound. By working with different partners that maybe have skills and resources that your company doesn’t have, you can get to some interesting places. Siggelkow: As you said, it’s human nature that if we have invested a lot in something, to pull the plug is hard. It’s also the question of how the organization deals with this. Do they really think about it as a failure, or as a learning experience? What’s the framing around these experiments? How have you created, in some sense, a culture where that’s okay, where people see these things as learning rather than a failure? Linnartz: What you have to do is celebrate when something doesn’t work and really mean that, not just say it. It’s easy to say you’re going to celebrate failure, but sometimes that doesn’t really happen. People watch what really happens. When someone gets promoted who has been out there experimenting and trying and everything didn’t work (but, of course, some things did work), people see that person get promoted or get that next big project. When people see that happen, the proof is in the pudding that people who take risks, who put themselves out there, get noticed and get recognized even if they don’t always succeed. We do a good job at Marriott International of doing that with our associates. Siggelkow: We briefly mentioned that there are lots of brands that are under the Marriott International umbrella, including Ritz-Carlton, Marriott, Sheraton, W Hotels, Courtyard Residence Inn, Westin, Renaissance Hotels, Le Méridien. A common corporate strategy question is always what’s the added value of belonging to a larger corporation? My question is, what’s the value that these brands get of being part of Marriott International? Why not have 30 independent hotel companies? Where’s the extra value coming from? Linnartz: The beauty of the depth of our brand portfolio is very much tied to the way people travel and are tied to our loyalty programs. Think about people and how they travel; I’ll use myself as an example. I travel for different purposes: I have children, I may be going to a lacrosse tournament somewhere in the middle of the United States, and I want to stay at a Courtyard. Then when my husband and I have a special anniversary weekend, we want to go to the St. Regis in New York. Then I might go to a big product launch for one of our partners at one of our bigger convention resort hotels. People travel to different types of hotels at different price points with different offerings. The same customer travels across all of our brands. Interestingly, we see that for our most loyal Ritz-Carlton customers, the property and the brand they visit second is Courtyard, for the very reason in the example I just gave you. The data really backs that up. All of our 30 brands are part of our loyalty program, currently Ritz-Carlton Rewards, Marriott Rewards, and Starwood Preferred Guest. We have such depth in our portfolio. Maybe you’ll stay at some of our business hotels for your company’s work, but then you get to earn all these points that you then use for your family vacation. You don’t have a strong portfolio without strong brands. The strength of our brands leads to the strength of our portfolio, which leads to the strength of our loyalty program. It’s all very interconnected in terms of how that works. I should point out, something about our portfolio brands that is especially compelling for loyalty is that we have eight superb luxury brands. When you earn all those points from all your business travel we have by far the deepest portfolio of loyalty properties around the world. Stephanie Linnartz is an experienced and accomplished leader in the travel, leisure, and lifestyle space. She currently oversees a wide range of critical business functions at Marriott International, with a portfolio of more than one million rooms, 6,700 properties, 30 leading hotel brands spanning 130 countries and territories with 750,000+ managed and franchise associates, and one of the largest loyalty programs in the world. Her ability to forecast and manage shifts and disrupters in the dynamic travel industry is informed by years of experience overseeing venerable brands, IT and Innovation. Named one of the world’s most influential marketing executives by Forbes, Stephanie has a unique perspective on consumer sentiment and spending across the globe. 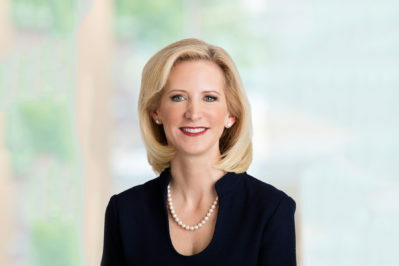 She started her career at Hilton Hotels Corporation; joined Marriott in 1997 as a financial analyst, working her way up in a wide range of positions with increasing scope; and is now one of the company’s highest-ranking executives. Linnartz also serves on the Board of Home Depot.